Bold, funky and diverse, Austin&apos;s vibrant mural scene illustrates the city&apos;s quirky side to a tee. Bring your camera and see the best of Austin&apos;s street art on a glorious story-telling graffiti tour. Greetings from Austin: (pictured above) At South First & Annie St. Take a fun pic in front of this vintage postcard replica on the side of Roadhouse Relics. Artist/owner Todd Sanders and friend Rory Skagen originally painted it in 1998. 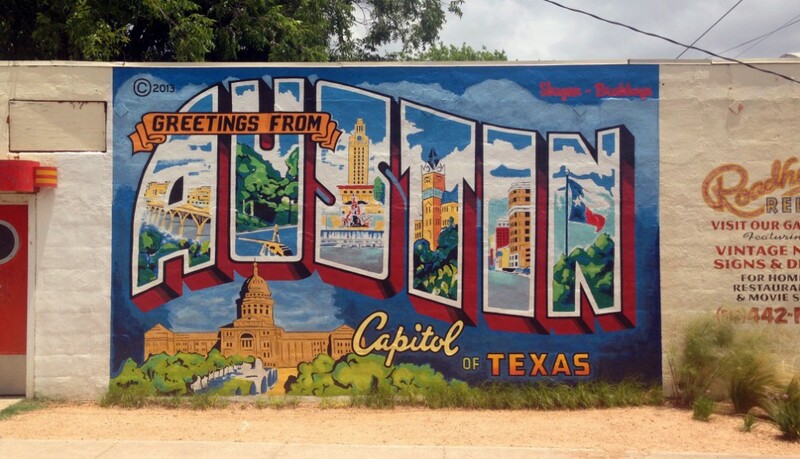 Everyone loves this colorful, welcoming Austin mural and locals even rallied together and pooled donations to restore the weather-faded artwork in 2013. I Love you so Much: At South Congress & James. Outside of Jo&apos;s Coffee, the iconic romantic lowercase scribble was originally spray-painted by local musician Amy Cook for her partner Liz Lambert, an owner at Jo&apos;s. In 2011, vandals messed with the wall, but the couple quickly fixed it. Photos of this highly recognizable mural are widespread and super sweet. Snap one with your favorite person! You&apos;re my Butter Half: At East Martin Luther King Jr. Blvd. & Alamo St. A Creative Suitcase designer came up with this playful piece for the United Way Greater Austin building. This East Austin mural features a love-professing bread slice and butter pat. Too cute to miss. Hi, how are you frog: Guadalupe & 21st St. This simple talking frog on the side of Thai restaurant "Thai, How are You" has appeared in Rolling Stone magazine. Artist and musician Daniel Johnston created the mural, "Jeremiah the Innocent," on the wall of a former music store in 1998. The friendly amphibian is now an iconic spot near the University of Texas campus. Share your Austin mural pics with us on Facebook and enjoy more peeks at Austin Street Art via painted walls and public wow on our Pinterest page!